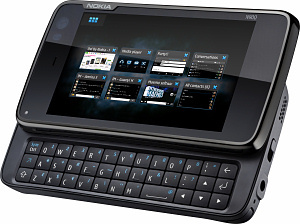 The Nokia N900 is the latest in Nokia's series of Internet Tablets, but perhaps more significantly the N900 is Nokia's first Linux-based mobile phone. This is a significantly different device from previous Nokia Internet Tablets, and in fact there are very few handsets that come near it in terms of specifications. We would even go as far as to say that the N900 has just defined a whole new standard for others to beat. A Linux phone has long been rumoured from Nokia as many industry observers think that Symbian struggles to meet the needs of newer and more powerful smartphones. If you've ever seen a Nokia 770, N800 or N810 in the real world you might be shocked at how big they are - they are so big that they are difficult to carry around in a pocket. The N900 is a significantly smaller device, weighing 181 grams and measuring 111 x 60 x 18mm, compared with 226 grams and 128 x 72 x 14mm with the N810. This smaller size is mostly achieved through having a smaller display, a 3.5" 800 x 480 pixel touchscreen panel as opposed to the 4.1" display on the N810. The N900 is smaller and lighter than the Nokia E90 too, although Nokia don't seem to be pitching the N900 as a replacement for the E90. There's a small slide-out QWERTY keypad with just three rows of keys and no navigation pad. If you're used to the more traditional layout of the E90, then you might find it a little disappointing, but it does look better than the keypad on the Nokia N97. 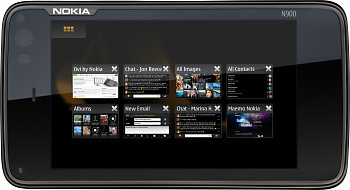 What really sets the Nokia N900 apart from the competition is the new Maemo 5 operating system, which is arguably the most powerful platform available on any mobile phone today. Based on the Debian Linux distribution, the N900 offers the possibility of some very sophisticated applications being available in the future. This runs on a 600 MHz ARM Cortex-A8 processor with 256MB of onboard RAM, plus 768MB of virtual memory for applications to use. The supplied software includes a Mozilla-based browser with full support for Flash and Web 2.0 technologies, an email client which includes support for Microsoft Exchange, Instant Messaging, a media player, PDF reader, calendar and a range of other applications. Maemo allows PC-style multitasking, and the new version of the interface is extremely polished looking and certainly appears to be as good as anything else on the market. There are a wide range of personalisation and customisation options, and there is also a lively developer community for add-ons. The operating system and applications can be updated "over the air", so there's no need to plug into a PC. We mentioned earlier that this is the first Internet Tablet that is also a phone - the Nokia N900 has 900 / 1700 / 2100 MHz UMTS plus quad-band GSM, it also supports HSPA/HSDPA high-speed data with a maximum download speed of 10Mbps, and a maximimum upload speed of 2Mbps. As with previous Internet Tablets, the N900 supports 802.11 b and g WiFi. Unlike the iPhone, you can use the N900 as a tethered modem on a laptop computer. Internal flash memory is up to 32 GB (which indicates that perhaps there will be a few different models available). The N900 will also take a 16GB microSD card, although it's possible that it will be able to take higher capacity cards when they become available. On top of that, there is an integrated GPS receiver plus Ovi Maps for personal navigation. The large touchscreen should suit in-car navigation, although the GPS on the old N810 was often not all that reliable.. hopefully this has now been fixed. The N900 also has a decent camera - in this case a 5 megapixel unit with autofocus, dual LED flash and a Carl Zeiss lens. Video recording is up to 800 x 480 pixels at a maximum of 25 frames per second which is comparable with other high-end Nokia handsets. There's a VGA resolution camera on the front for video calling. You can geo-tag photos and videos with GPS coordinates, and the N900 includes a photo editor. Pictures can be uploaded and shared with others via Flickr or Ovi. The media player can cope with MP3, AAC, M4A, WAV and Windows Media audio plus MPEG4, H.264 and H.263, Xvid and Windows Media video clips. You can output video to a TV using the supplied video out cable, and listen to audio using the standard 3.5mm audio socket. 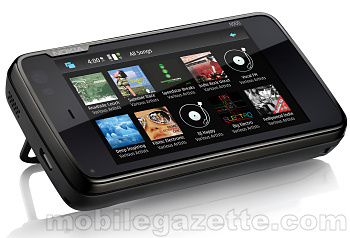 The N900 also comes with an FM transmitter, so you can play back to almost any stereo system without wires. The N900 is designed to be always online, and this does tend to eat into the battery life. The 1320 mAh BL-5J battery gives up to 5 hours talktime on 3G and 9 hours talktime on GSM. Nokia haven't quoted a "standby time" as they envisage that the N900 will always have some sort of active data connection, which it should be able to manage for 2-4 days on a full charge. 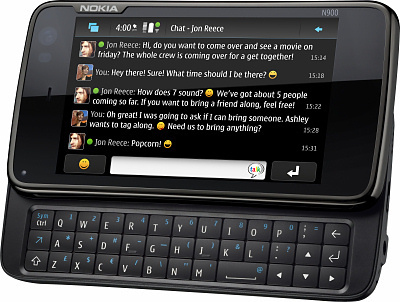 Nokia also say that the battery should be able to drive the N900 for a whole day's active use. Charging is done through the N900's microUSB port, so we guess that it can also be charged from a laptop as well as the supplied AC-10 charger unit. So, it's an utterly comprehensive device when it comes to specifications and there are perhaps only two things that we can see that might be a problem. The first is the screen size - 3.5" is big, but nowhere near as big as the 4.1" display on the previous model. The second problem is price, Nokia say that the N900 will cost around €500 before tax and subsidy - and you can buy a laptop computer for that price. 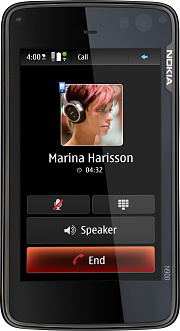 Nokia say that the N900 should be available during Q4 2009 in any colour you like, as long as it's black. The Nokia Conversations team have posted three different demonstration videos to watch here.